My randomly generated Wikipedia page today is “Cottrell, Oregon.” This is an unincorporated community in Northern Oregon once home to a post office and named after a family. Cottrell, Oregon’s Wikipedia page has only one paragraph of description, leaving a lot to be imagined. Cottrell Oregon make me think about Oregon, and if I knew anyone from Oregon. I do–one guy who I met this summer. His name is Andrew but since we know another Andrew, my friends all call him Portland Andrew. Portland Andrew brought cigarettes on the trip. Anne and Chris brought Tina. And I brought a tent that was surprisingly less stifling than I was expecting it to be. It was the hottest night in August after all. It’s not like Steve and I didn’t have friends. But Steve was new and I was desperate to be well-received by this older, obviously much cooler than me crowd. Leslie is a very proficient planner and I have since come to trust her to organize almost anything with ease. She had chosen the campground based on its reviews and its plethora of floating options. She and Liberty had not only gotten food for the trip, but had also prepared it into a carrot curry salad, humus wraps, and even little fruit balls soaked in vodka as a mid-river-hot-sun-snack. They were good. I dropped the jar into the river spilling the fruit flavored vodka into the shallow spot where I was sitting at lunch and even though everyone made a fuss, I don’t think they really cared. Every time I’m on a river I think it will be like the other times I’ve been on a river and it never is. This river was large. Our caravan of half a dozen canoes could have floated side by side with space to spare. The deep spots were almost aqua and incredibly inviting under the sun. 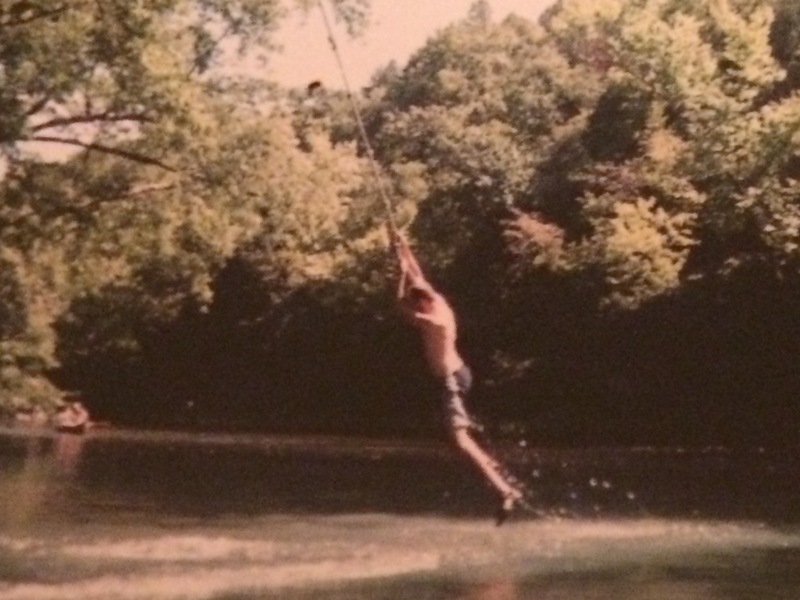 And this river, not unlike my other rivers, had rope swings. I don’t know who puts the rope swings there. It feels like they’ve been there forever and kids have squealed and belly flopped a million times from their ends. I imagined that a movie scene with kids running naked and splashing and teasing was filmed in that spot–no matter the spot–when we came to a new one. We all had to take a turn, obviously, and each of our launches and landings and post-swing reactions were like little microcasms of ourselves. Watching these new friends let go the ragged, knotted ropes and fall into the water was like getting to know them in the time it took to them to splash. Chris was eager–eager to go, eager to impress, eager to please us with his silly and strong tricks off the rope. He would climb the tree first and fetch the rope and bring it into all of our grasp. Ann and Sarah and Liberty were reluctant. They cautiously approached the tree and slipped up it’s branches. Sarah hit the water in the worst and most ungraceful way I can imagine. Liberty only jumped once, but when she did it was like watching a crane float to the water’s edge and precisely grab a fish. Lebo jumped and twirled and looked like the dancer she is. Steve splashed–he always splashes. And just like that–as I hit the water, and the momentary burn faded from where I’d hit and I swam to surface–I felt the bliss of summer and the gratitude of making new friends.